Valentine’s Day will be here before you know it. Have you thought about what you are going to make your special someone? If not, don’t worry, because I have you covered with my Nutella Sea Salt Molten Love Cakes. Molten or Lava Cakes, whatever you want to call them, might be my favorite dessert of all time. Their chocolatey flavor and gooey centers are everything. I thought I would put a little nutty twist on the ubiquitous chocolate lava cake with some nutella and sea salt. These are just the thing to serve for a Valentine’s Day dessert. Here is how to make them. First, generously butter your KitchenAid® Ceramic 4-Piece Stacking Ramekin Bakeware Set and set aside onto a KitchenAid® Sheet Pan. I seriously love the larger than average eight ounce size of these ramekins. And how perfect are they for Valentine’s Day? 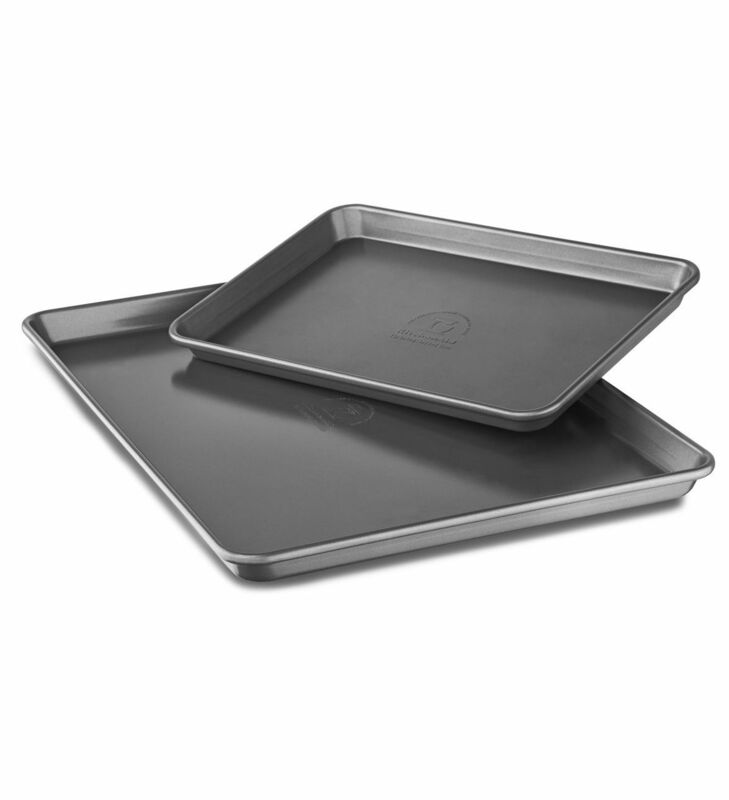 I use these baking sheets almost everyday. They stand up so well to my abuse. They seem to be virtually resistant to getting burned or stained. Melt the butter, chocolate, and Nutella in a KitchenAid® Tri-Ply Copper 3.5-Quart Sauté on the melt setting of your KitchenAid® 36” 5-Burner Gas Cooktop. 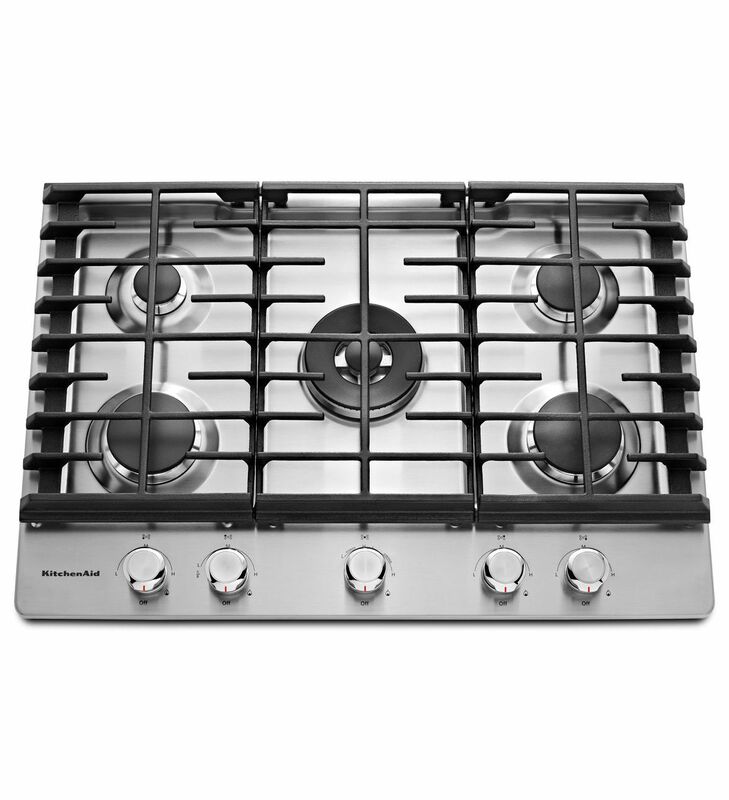 The melt setting on this cooktop is what dreams are made of. 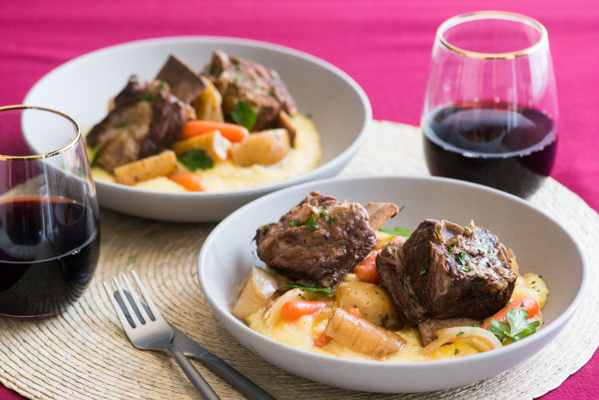 For most recipes, like this one, it eliminates the need for a double boiler. In a KitchenAid® Professional 600™ Series 6 Quart Bowl-Lift Stand Mixer with the flat beater or whisk attachment, beat the eggs and sugar together. I seriously love my Professional Series Stand Mixer. It’s so worth the extra investment. I use it all the time! Add in the vanilla and then pour in the chocolate mixture. Add in the flour and salt. Beat until well combined. Divide and pour the batter into the four ramekins. Bake the ramekins in your KitchenAid® 30″ Combination Wall Oven with Even-Heat™ True Convection for 12-15 minutes or until the sides are firm and the middle is still wet. This oven is amazing. 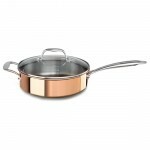 It has a steam setting, so it keeps your food moist while cooking. 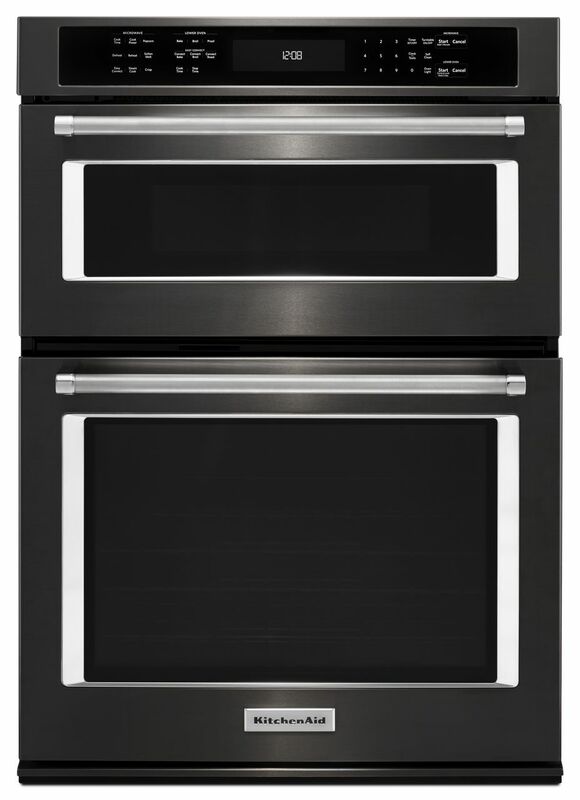 And don’t get me started on the new black stainless steel color; it’s stunning! You will want to serve the cakes immediately. You can serve the cakes inside the ramekins or you can pop them out for serving. To pop them out, run a knife along the edges of the ramekins, and invert them onto dessert plates. Before serving, sprinkle each cake with sea salt. 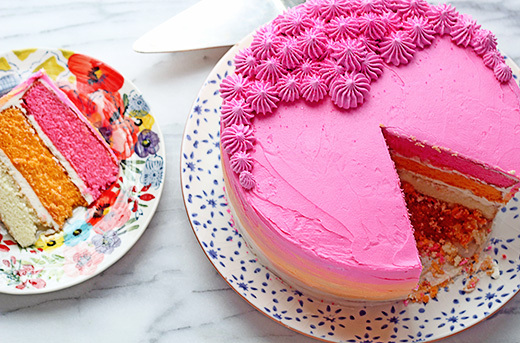 To decorate the cakes, place small stickers or cutouts onto each cake. Using a sifter or fine mesh strainer, generously sprinkle powdered sugar over each cake. Using tweezers, carefully remove the stickers or cutouts. 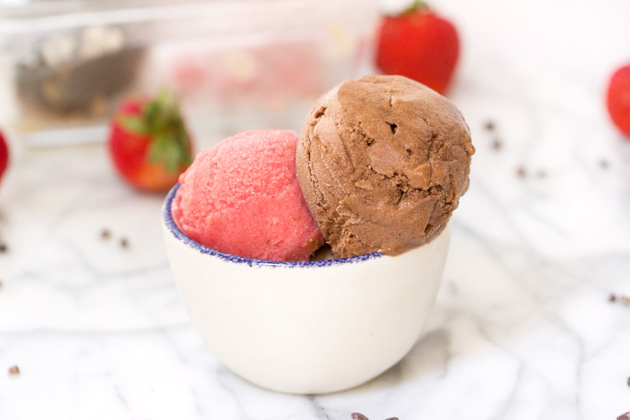 Serve with a scoop of hazelnut ice cream. 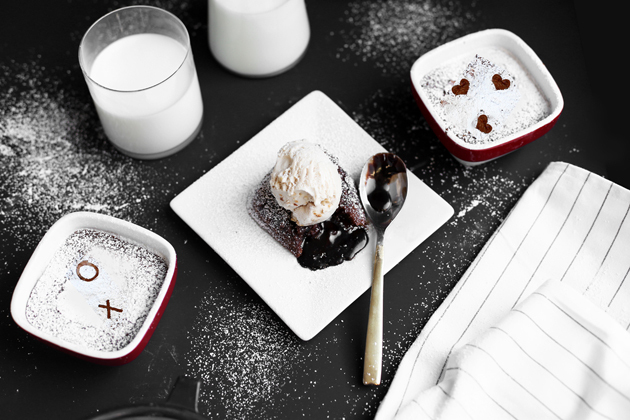 What other ways could you spruce up the traditional chocolate molten cake? Be sure to share your take on this Nutella Sea Salt Molten Cakes recipe with us on Instagram using #MadeWithKitchenAid for a chance to be featured. 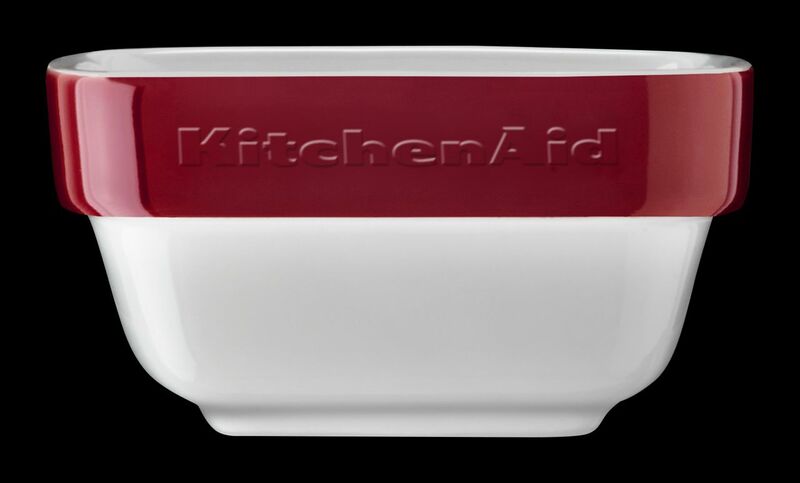 Preheat your KitchenAid® 30″ Combination Wall Oven with Even-Heat™ True Convection to 400º F.
Generously butter your KitchenAid® Ceramic 4-Piece Stacking Ramekin Bakeware Set and set aside onto a KitchenAid® Sheet Pan. Melt the butter, chocolate, and Nutella in a small saucepan on the melt setting of your KitchenAid® 36” 5-Burner Gas Cooktop. 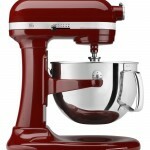 In a KitchenAid® Professional 600™ Series 6 Quart Bowl-Lift Stand Mixer with the flat beater or whisk attachment, beat the eggs and sugar together. Add in the vanilla. Pour in the chocolate mixture. Add in the flour and salt. Beat until well combined. Divide and pour the batter into the four ramekins. Bake the ramekins in the KitchenAid® 30″ Combination Wall Oven for 12-15 minutes or until the sides are firm and the middle is still wet. Serve immediately. You can serve the cakes inside the ramekins or you can pop them out for serving. To pop them out, run a knife along the edges of the ramekins, and invert them onto dessert plates. Before serving, sprinkle each cake with sea salt. To decorate the cakes, place small stickers or cutouts onto each cake. Using a sifter or fine mesh strainer, generously sprinkle powdered sugar over each cake. Using tweezers, carefully remove the stickers or cutouts.